The Department of Economic Development is proud to have scooped a double Award win at the 2012 prestigious Isle of Man Newspapers Awards for Excellence ceremony last Thursday evening. Hartley Elder, Director of Aircraft Registry, accepted the Customer Service Award, sponsored by the Boston Group, on behalf of Isle of Man Aircraft Registry and Heather Smallwood, Head of Marketing, received the Marketing and PR Effectiveness Award, sponsored by Isle of Man Advertising, on behalf of the Department. The Marketing and PR Effectiveness Award recognised the Isle of Man Where You Can marketing programme, the aim of which was to create a unified visual identity for the Isle of Man and to help position the Island as a leading international business centre. Working across Government and with the business community, the Department of Economic Development worked with two local agencies (Mainstream Media and Intelligence Ltd) to build on the successful Freedom to Flourish strategy to develop this new initiative. Factsheets, a new website, social media channels and images were devised and there has been a strong engagement from the business communities and target audiences since the launch in May this year. The Customer Service Award recognised the world class standards of service that the Aircraft Registry, their technical partners across other parts of Government and the Islands private sector continues to provide. The Isle of Man has become a one-stop shop for worldwide aviation business and it provides the kind of personal service unmatched by other aircraft registry jurisdictions. The commitment shown has been rewarded with excellent customer testimonials. "Our Department has a history of being recognised at the Isle of Man Excellence awards over the last several years and I would like to sincerely congratulate the Aircraft Registry and the Marketing team on their achievements at this years 2012 awards which were for Customer Service and Marketing and PR Effectiveness"
"It is very well deserved recognition to all within the Department of Economic Development for a great deal of hard work, teamwork and commitment. We recognise that it is more important than ever to step up the drive for economic development and diversity and credit must be given to those who work closely with business clients and customers to strive to make our Island a better place to live and work." "I would like to thank the staff in the Aircraft Registry, our technical partners in the UK, other parts of Government and the Islands private sector, for their support and dedication which has seen 500 aircrafts registered since its launch on 1st May 2007. This is a really great team effort and I am proud to be part of a dedicated team who continually aim to deliver the highest worldwide standards." 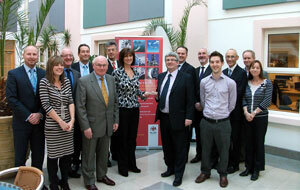 "I was delighted to receive the Award for the Where You Can initiative on behalf the Department. The programme brings together for the first time a unified message about the products, services and benefits that the Isle of Man can offer to a wide range of audiences." "Having developed the programme, with much input from local industry experts, we are now in a position to take this message as wide as possible and engage even further with our audiences through elements such as the e-newsletter, featured on the homepage of the website, and exhibitions undertaken jointly between Government and industry, also listed on the front page of the website."